The image from the North Tahoe Fire Protection District shows smoke emitting from the wildfire near Boca Reservoir at about 4:30 p.m. Monday. 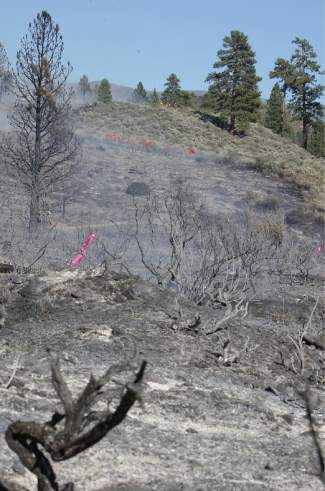 A wildfire burned through brush and sage Monday afternoon east of the dam at Boca Reservoir, charring 84 acres before crews extinquished the blaze. In all, four air tankers (including this one from CAL FIRE) were called to the scene Monday afternoon to battle the fire burning east of the dam at Boca Reservoir. Smoke was visibile during the fire's early stages, as this image shows at about 3:30 p.m. Monday. Calfire was among several regional fire and emergency agencies to respond to Monday's 84-acre Boca Fire. A helicopter dumps a load of water on Boca Fire Monday afternoon. The fire, the cause of which remains under investigation, charrred 84 acres before several regional crews put it out at about 10 p.m.
An air tanker drops retardant on the Boca Fire while flying through thick smoke Monday afternoon. Hand crews from the U.S. Forest Service and the Washington Ridge Crew were deployed to the Boca Fire. An air tanker drops a load of retardant on the Boca Fire Monday afternoon. 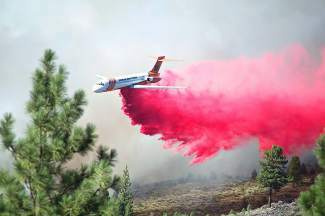 No structures were threatened in the fire that burned a few miles north of Lake Tahoe. 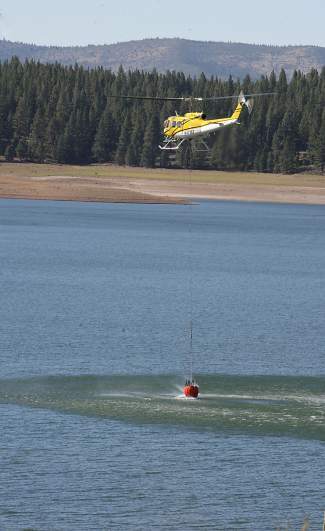 A helicopter dips into Boca Reservoir Monday afternoon to help battle the Boca Fire. 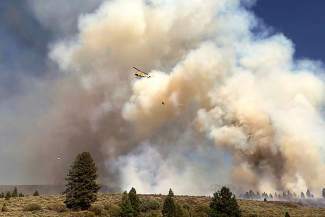 Sierra Sun Community Editor Amy Edgett drove out to the scene Monday afternoon and captured several images of the fire, smoke and response from regional emergency crews. Visit the Sierra Sun’s Facebook page to view them, or click here for direct access. 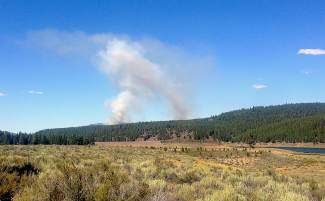 TRUCKEE, Calif. — Emergency crews worked quickly to extinguish a wildfire that charred 84 acres Monday in the area of Boca Reservoir. The blaze — dubbed the Boca Fire — started for unknown reasons at 3 p.m. and ballooned to 75 acres by 6 p.m., officials said. 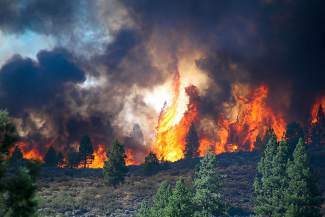 It eventually grew to 84 acres before it was 100 percent contained by 10 p.m. Monday, according to the U.S. Forest Service. 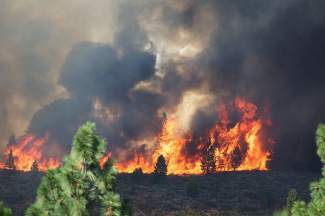 No on was hurt and no structures were threatened, said Paul Spencer, public information officer for the Truckee Fire Protection District, and the nearby Glenshire subdivision was never in danger. The fire burned off Interstate 80 near the old Boca township, east of the reservoir’s dam. The nearby Boca Springs campground, east of the reservoir in the Tahoe National Forest, was evacuated as a precaution, according to USFS. People were allowed to come back Monday evening. Windy conditions and the dry nature of the Sierra landscape due to the ongoing drought enabled the blaze to spread and run up the slopes east of Boca. 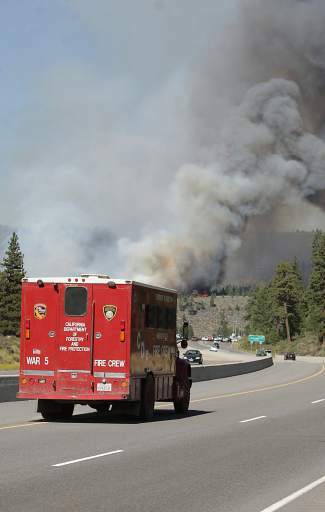 Forward progress was stopped just before 6 p.m., according to Truckee Fire. 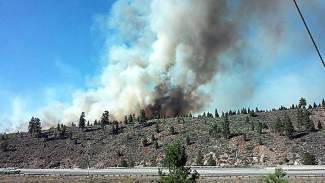 Officials from Truckee Fire and USFS, as well as Calfire, North Tahoe Fire Protection District, North Lake Tahoe Fire Protection District, Squaw Valley Fire Protection District, Meeks Bay Fire Protection District and Northstar Fire Protection District responded. 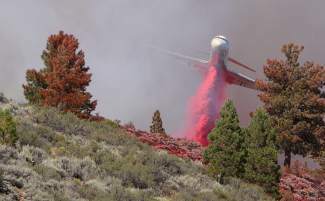 In all, 21 engines, four air tankers, three helicopters, four water tenders and two dozers, along with several ground crews, responded.